PS – Never order boneless wings in the vicinity of Buffalo, New York. It’s just not a thing. The traditional wings are always served on the bone, and it’s up to you whether you prefer the drumettes or the wingettes. I tend to grab the drumettes because they’re easier to eat, but the wingettes seem to have a lot more flavor. Even though our wings came from The Cherry Lounge in Jamestown, New York, the best wings, in my opinion are from Guppy’s in Bemus Point, NY. Guppy’s was owned by my Aunt Sally and Uncle Mike and theirs were always the best. Crispy and spicy, with just the perfect kiss of butter. They’ve since sold the restaurant, but I was back a few summers ago and I have to say that the wings are still amazing. 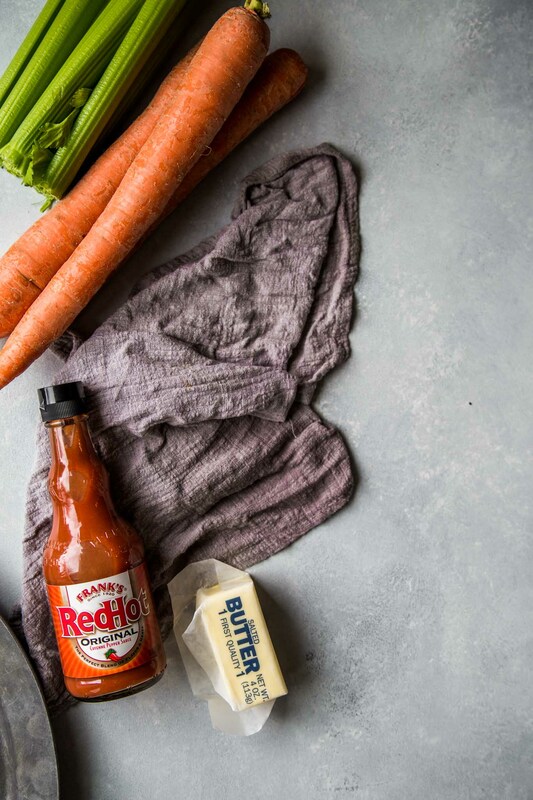 Their buffalo wing sauce recipe is simple, and it’s always been the authentic way to make buffalo wings – using Frank’s Red Hot Sauce and butter. In my version, I added in a dash of Worcestershire sauce and Tabasco too. 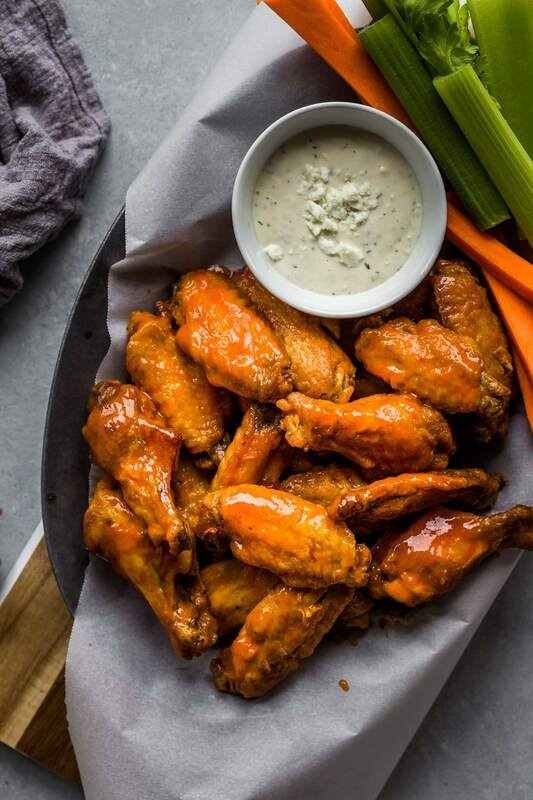 As you probably guessed, the authentic way to make buffalo wings has always been to deep fry them, but I’ve discovered that you can make chicken wings just as crispy in the Air Fryer, plus it saves some calories, meaning that you’ll feel a little less guilty about the aforementioned butter/Frank’s Red Hot Sauce. You’ll honestly never believe these wings weren’t fried in the deep fryer. They are some of the most crispy chicken wings I’ve ever tried! Do you have an Air Fryer yet? Spray the Air Fryer basket with cooking spray before adding the chicken. It helps prevent sticking and the tiny bit of oil makes the wings extra crisp. There’s no need to preheat your Air Fryer. Just turn it on and go! Start the wings at a lower temperature and then increase the temperature for the last 5-15 minutes to get them extra crispy. The total time will vary depending on how big your wings are. Shake the basket throughout the cooking process to help the chicken wings brown more evenly. Customize your buffalo wing sauce. Be sure to keep reading to find out how to make mild, medium or hot buffalo sauce. Use 8-ounces Frank’s Red Hot Sauce, 8 tablespoons butter, and a dash of Worcestershire sauce and Tabasco. Use 12-ounces Frank’s Red Hot Sauce, 6 tablespoons butter, and a dash of Worcestershire sauce and Tabasco. Use 14-ounces Frank’s Red Hot Sauce, 4 tablespoons butter, and a dash of Worcestershire sauce and Tabasco. 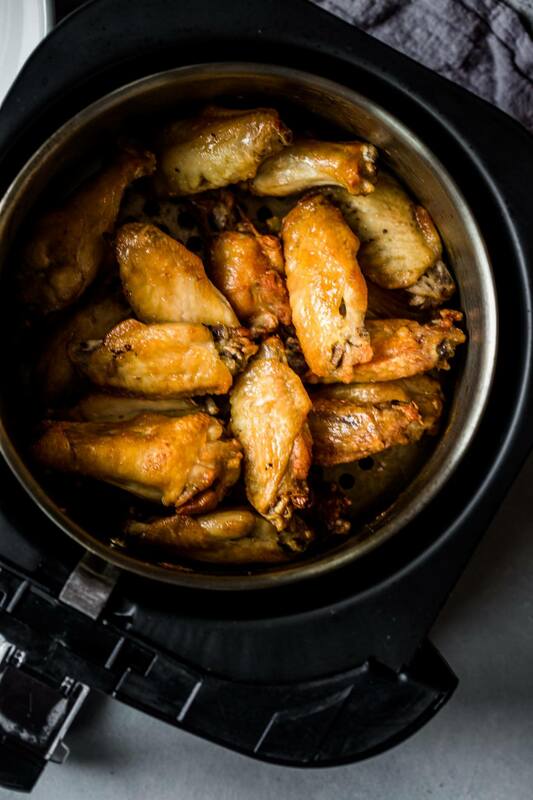 Chicken wings take 30-40 minutes to cook and become crispy in the Air Fryer. Before starting the cooking process below, cook the wings for 10 minutes at 350 degrees, to help them thaw. Give them a toss then increase the temperature to 380 degrees and follow the recipe below. Spray the Air Fryer Basket with cooking spray and cook at 400-degrees for 5-10 minutes, until heated through and crispy. PS – If you really love authentic buffalo sauce flavor, you should be sure to try my Buffalo Chicken Chili too! These Air Fryer Chicken Wings cook up amazingly crispy and juicy without deep frying. Then they’re tossed with a spicy buffalo wing sauce that can be made mild to hot, depending on your taste preference. Place chicken wings in basket and cook at 380 degrees for 25 minutes, shaking the basket every 5 minutes. After 25 minutes, increase the temperature to 400 degrees and cook for 5-15 minutes longer. Shake every 5 minutes and begin checking for doneness at 5 minutes. Remove when the wings are crisped to your liking. 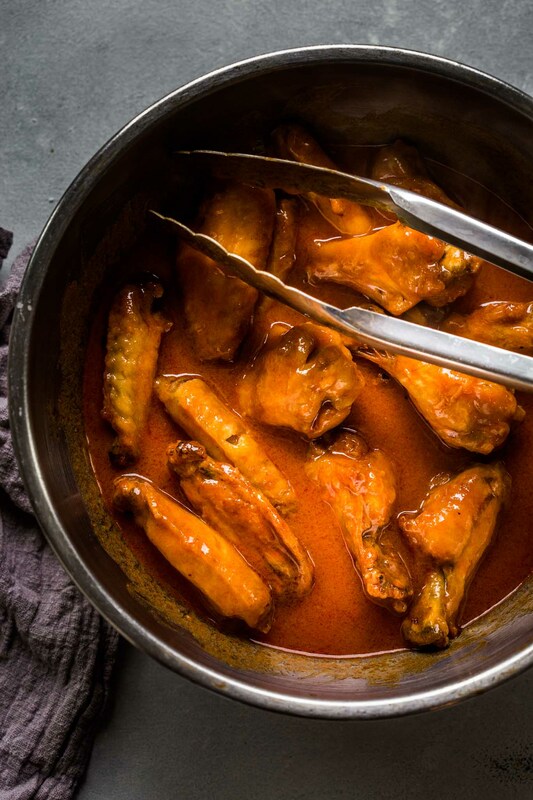 While the wings are cooking, combine the Frank’s Red Hot Sauce, butter, Worcestershire sauce and hot sauce in a large mixing bowl. Set aside. When the wings are finished, dump them into the mixing bowl with the sauce and toss to coat. Serve immediately. If you use less or more than 2 pounds of chicken wings, the cook time remains the same. Tongs – I use these when tossing the wings with the buffalo sauce. Large Mixing Bowl – Perfect for making your buffalo sauce and big enough to toss those wings in. If you loved these Air Fryer Chicken Wings I would appreciate it so much if you would give this recipe a star review! Also, be sure to snap a picture of your finished dish and share it with me on Instagram using the hashtag #platingsandpairings and tagging me @platingsandpairings. To tame the heat of these buffalo wings, look for a wine with a hint of sweetness. 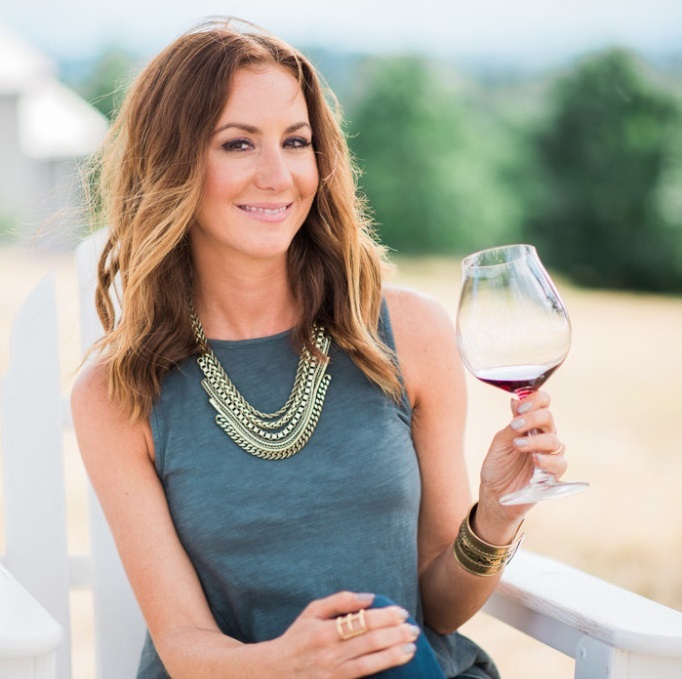 Riesling and Gewurztraminer make great options. 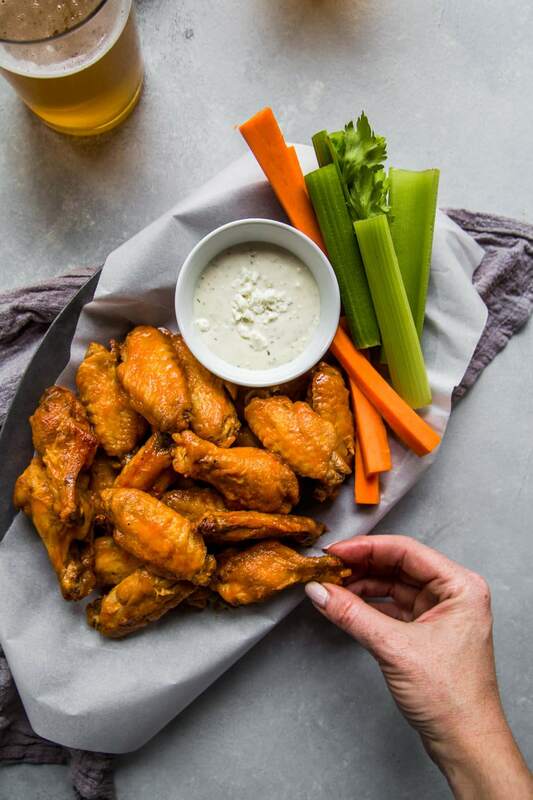 Even though I usually give wine pairings, I’d also suggest pairing a light beer, like a pilsner with these buffalo wings. I didn’t know you grew up on the east coast!! That’s so cool 🙂 I also love a good buffalo wing! I’ve been reading all about these air fryers lately- I’m trying to convince Drew to purchase one. Maybe with your code it will sway his choice! Those wings look amazing!! Thanks Rachel! Yes, I’m an East Coast girl, but definitely a West Coast girl at heart (minus the lack of Buffalo wings!). Awesome! 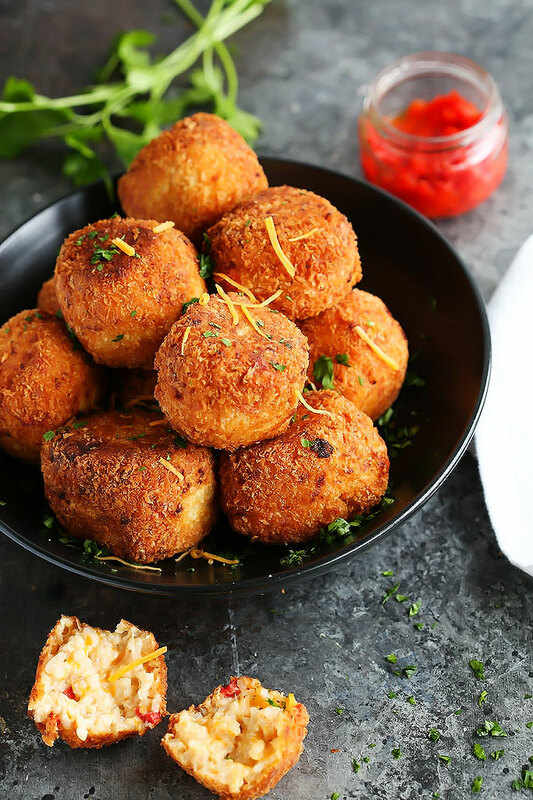 What are some of your favorite air fryer recipes Marlynn? 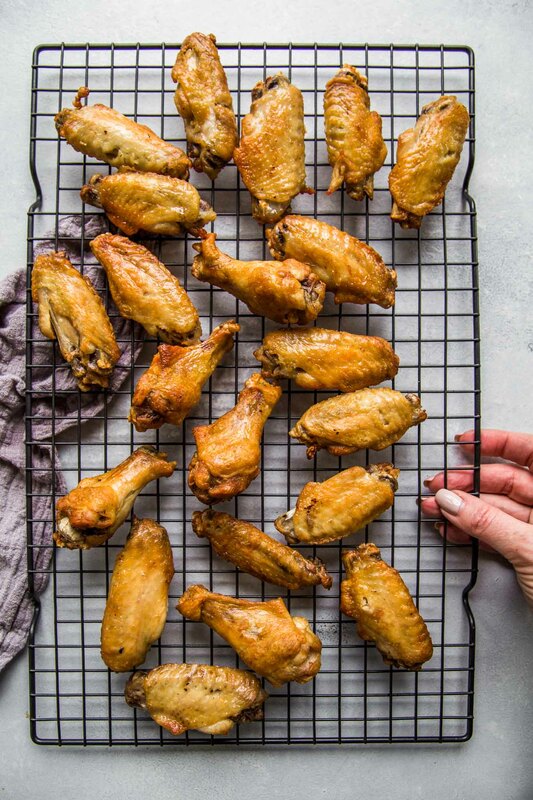 I don’t even have an air fryer, but this post is making me SOOO hungry for some wings. Wings have a soft spot in my heart. Me too Ben – Totally! I love buffalo sauce but I have never made my own! I really should as these look amazing. You definitely should! It’s so easy and delicious too! I’ve never heard of an air fryer before, and it sounds too good to be true! I’m still testing it out Catherine, but it worked absolutely perfectly for these wings! These wings looks so amazing! You would never know that they weren’t fried! Yes!!! They are absolutely so crispy with the air fryer, plus less fat! This recipe for Air Fryer wings came out perfectly for me! They were so crispy and flavorful! So happy to hear that! I’m in love with this recipe! 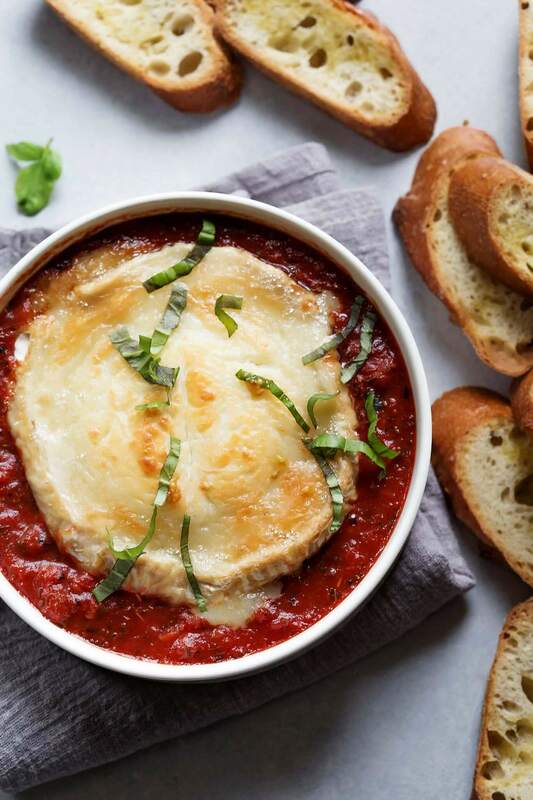 This recipe does look amazing! I’ve used my air-fryer to cook steaks and it’s almost too easy. It sears them on the outside and perfectly cooked on the inside, dependent upon the timing. Thank you for this great recipe! Thanks Marv – I attempted steaks in the air fryer once but didn’t love the way they turned out. Any tips? When I was younger(don’t want to mention ages here), we use to go to BJ’s in Fredonia, NY, about 45 miles south of Buffalo. Those were the best wings ever! They offered $.10 wings and $.50 Molsons beer on Wednesday. I would always order 100 wings, play foosball while waiting and my share of beer. We would eat half the wings and take the rest home to enjoy later. The difference in their wings was they baked them after applying the sauce. Oh so good! Not the dripping wet wings you see everywhere now. I love that tip Jerry! I grew up about a half hour from Fredonia but never made it to BJ’s. I may have to check it out on our next trip out there! Wow this looks great. I want to try the vietnamese style ones you have as well. Using the air fryer to “fry” chicken is probably one of my favorite uses of the one we have at home. I’m with you on trying the Vietnamese ones in the air fryer Joe! I’ve been wanting to give that a try for some time now! Hello Erin! Santa brought me my 1st air fryer. My very first recipe? Your buffalo wings. OMG so good my wife and kids loved them! So good my wife said theres no need for me to go to Hooters for wings ever again! 🤣☹ Keep up the great work! I’m so happy to hear that you and the family liked them. Happy Holidays! Do you have a recommendation on a particular wing sauce to use? I purchased an air fryer this past weekend…My first dish was buffalo wings…AMAZING!! My second dish was country style spare ribs and they were delicious as well. My highlight of the day is figuring out what to experiment with next….I love my new gadget! I’m so happy you’re loving your Air Fryer Tracy! Recipe is wonderfull – to kick them up a notch, after cooking and coating, I put back in the fryer for five minutes, followed by a second dousing of sauce – sometimes I add timari and spice wjen flipping. Just got a new air fryer and chicken wings are definitely on the list to make! One thing I’ve heard but never tried is to mix cornstarch into the sauce. The idea is that the residual heat in the wings causes the cornstarch to thicken the sauce so it sticks better. I love the Jamestown nod! Miley’s rivaled the Cherry for a little bit though. Using this today in my new air fryer. Did you use the Franks orgingal or the buffalo wing sauce? Not sure if there is much of a difference. Looking for a mild flavor. Hi Helen – I use the Franks original. Hope that helps! Thank you for this post! We are trying ours out tomorrow. Should the vent be open or closed? I relocated fron New York to Atlanta. Wings are not great down here. Either the sauce has a funny taste or the wings are fatty and under cooked. The wings come out so crispy with your directions. The mild Buffalo sauce is a medium heat, perfect with a nice flavor. My only complaint is that the Buffalo sauce is too salty. Could it be from me putting in too much tobasco or Worcestershire sauce? It would have been a 5 star recipe for me if it wasn’t too salty. 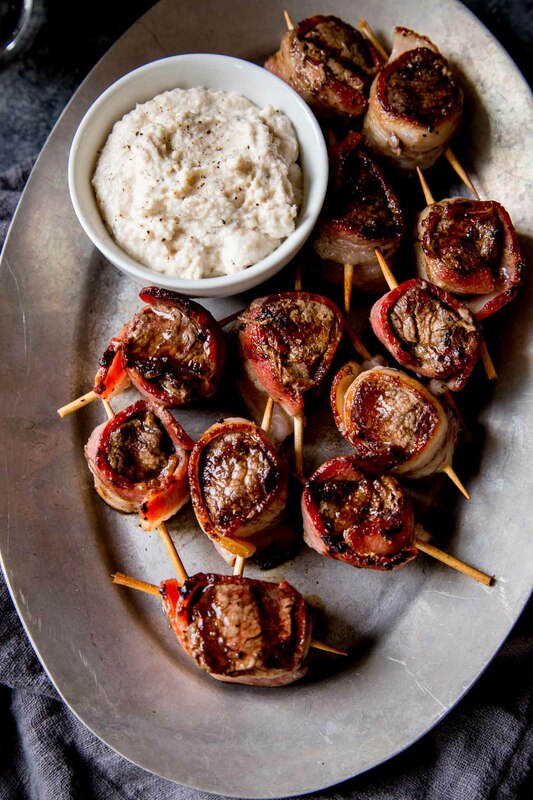 I am making these today for the CHIEFS game! Will post Instagram pics when done. I am loving the air fryer my wife got me for Christmas. This will be my first crack at wings, thanks for the recipe; I am looking forward to them! The BreakTime on Buffalo Street had the best wings. I live in Virginia now and if I don’t make them myself I have to go home to get them! Thanks for the tips on the air fryer. I was given one but, haven’t tried it out yet. 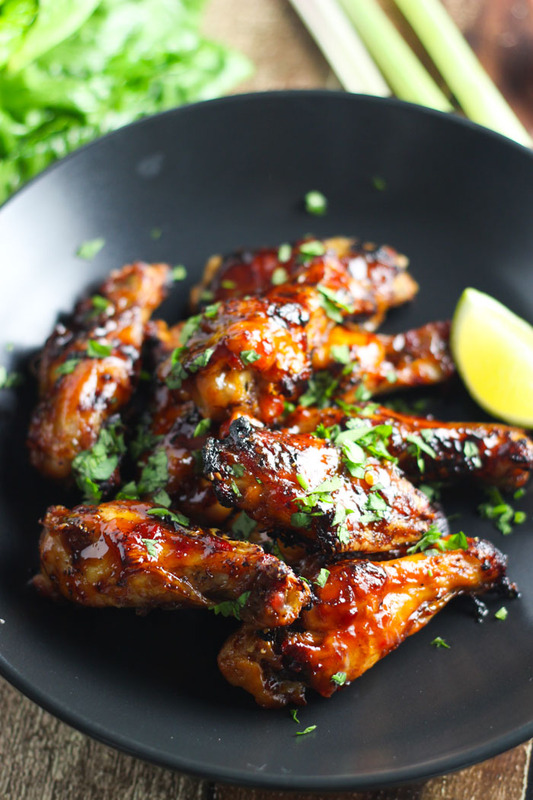 Very nice recipe I love airfryer chicken wings but with your recipe I am going to cook them by myself this time thanks for sharing it. What wings do you buy? Loved reading your story! I am from Buffalo so it was nice to hear your story. Can’t wait to try these tonight!!! I hope you love them Michele! Amazing! Best at home wings ever! I’m so glad you liked them Lori! Amazing! Best at home wings ever!!! Crispy and delicious- my kids gave them excellent reviews! Wish I had made more! I’m so happy to hear that Lori – Thanks for the feedback! You are so welcome Jenn! Hi Marie – My air fryer was large capacity. Perfect Wings!! I have the air fryer with trays so I had two trays going. Not sure how much meat there was. I cooked for 12 minutes and then switched tray levels. Cooked for 12 more, then flipped the wings over. Turned up to 400, baked for 5, switched rows and then for another 5. I did flip them one more time at and put in for additional 3. Perfecto!! I’m so glad you liked them Melissa! Am I missing something or is the serving size missing? The nutritional information is useless without a serving size. There are 4 servings in this recipe and each serving is about 5 wings. Hope that helps. Hey neighbor! Frewsburg girl here! Thanks for the recipe! Just getting the hang of my new air fryer! Hi Kim – Thanks so much for stopping by! 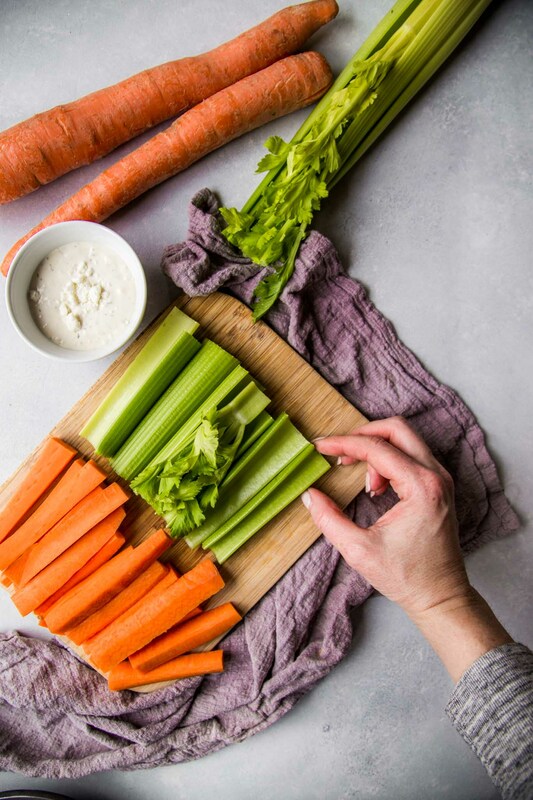 Can’t wait to try this with our pasture-raised chicken wings! I would ONLY trust a recipe from someone from SW New York. No one here in Florida knows how wings are supposed to be! 🙂 Never had Guppy’s, but French Creek Tavern wings were my standard, being from the Jamestown area myself. Thanks! You are welcome Alyson – Enjoy! I’m from Jamestown! And the French Creek Tavern wings are extraordinary! Cheers Mark! I hope you loved them! I just got an air fryer 2 days ago and have been cooking EVERYTHING in it and I can’t wait to try these wings out! You can’t EVER have to many wings! I agree Carl – I hope you enjoy!